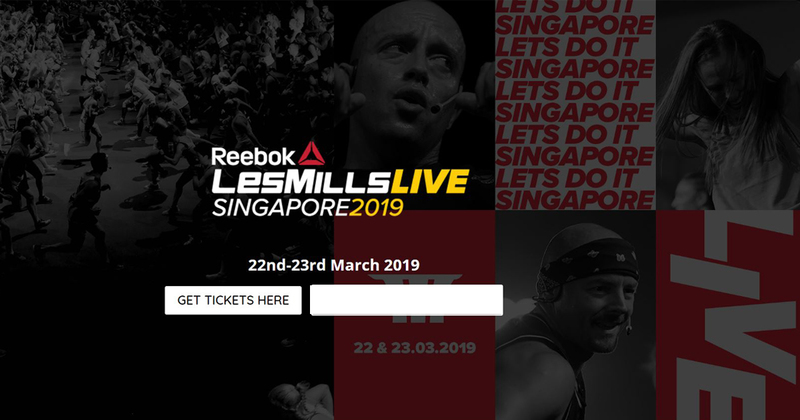 Reebok Les Mills Live is back in Singapore on 22 & 23 March 2019! Now on its second year, the event will be hosting over 1,000 participants working out at the iconic Marina Bay Sands Convention Centre alongside some of the best Les Mills Instructors in the world and other Les Mills lovers. Hosted by Les Mills Asia Pacific, participants will work out to some of their most loved Les Mills programs including BODYJAM®, BODYPUMP® and BODYCOMBAT® in a pumping, party atmosphere. Friday night will also be “cycle centred” with a timetable full of cycle programs this year for the first time, powered by BODY BIKE®. RPM – a group indoor cycling workout where you control the intensity, low impact and burns loads of calories. The instructor takes you on a journey of hill climbs, sprints and flat riding. In an RPM workout, you repeatedly reach your cardio peak then ease back down, keeping pace with the pack to lift your personal performance and boost your cardio fitness. THE TRIP – a fully immersive workout experience that combines a 40-minute multi-peak cycling workout with a journey through digitally-created worlds using a cinema-scale screen and sound system. LES MILLS SPRINT – a 30-minute High-Intensity Interval Training (HIIT) workout, using an indoor bike. It’s a short, intense style of training where the thrill and motivation come from pushing your physical and mental limits. A high intensity, low impact workout, it’s scientifically proven to return rapid results. BODYPUMP – a barbell workout for anyone looking to get lean, toned and fit fast. It can burn up to 540 calories. Instructors will coach you through the scientifically proven moves and techniques. BODYBALANCE – a yoga-based class that will improve your mind and body that is ideal for anyone. You will bend and stretch through a series of simple yoga moves and embrace elements of Tai Chi and Pilates. Breathing control is a part of all the exercises, and instructors will always provide options for those just getting started. SH’BAM – an ego-free workout with no dance experience required. All you need is a playful attitude and a cheeky smile. LES MILLS BARRE – a modern version of classic balletic training; a 30-minute workout designed to shape and tone postural muscles and build core strength. It is a combination of cardio and strength with high reps of small range-of-motion movements and very light weights. BODYJAM – Choreographed by Gandalf Archer-Mills in Auckland, New Zealand, BODYJAM is the ultimate combination of music and dance. Tracks that you love right now? They’re in BODYJAM. That new style you’ve heard about? It was in BODYJAM last year. BODYCOMBAT – a type of combat workout that can burn up to 740 calories. This high-energy martial-arts inspired workout is totally non-contact and there are no complex moves to master. The instructor will challenge you to up the intensity and motivate you to make the most of every round. Tickets for Reebok Les Mills Live Singapore are on sale now at a super early bird rate, so be sure to grab yours here.